I want to answer a really important question that is near and dear to our hearts, especially depending on the season of life to you may be in. 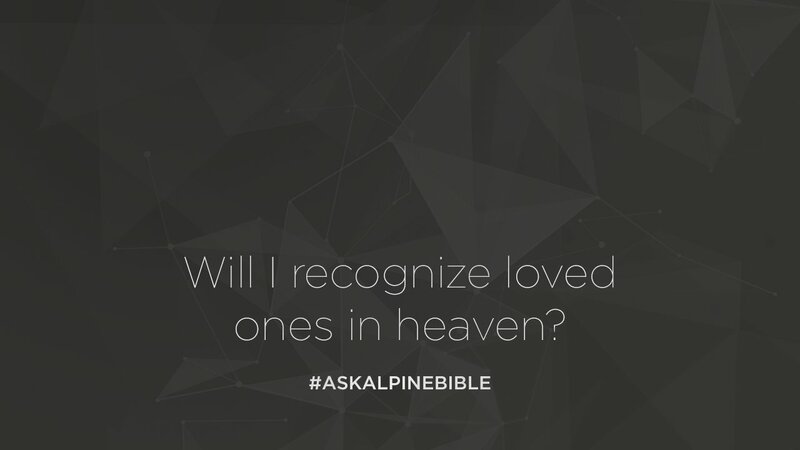 You may have lost someone recently and maybe you’ve even thought of the question, will I see them again or will I recognize them in eternity when I get to heaven? How does Jesus have that for us? Do we know each other in eternity? For those who are in Christ, I would say the answer to that question is: yes. Let me just give you a few reasons why to validate that, so you can be comfortable with the fact that you’re going to recognize your love ones in Christ in eternity. When Jesus was at the Mount of Transfiguration, the Bible tells us that Moses and Elijah appeared with Jesus. Peter, James and John were there with Jesus and they recognized Moses and Elijah there with Christ. It’s apparent there’s a resemblance of them that’s noticeable whereby Peter, James and John could identify them after they had gone on into eternity. The Bible tells us in Hebrews we have been surrounded by such a great cloud of witnesses, meaning people are looking onto us and rooting on God’s grand plan for life being played out here on earth. It gives us the idea that your loved ones are looking on to the earth. When you get the book of Revelation, it says for us that every tribe, tongue and nation is there before the throne of the lamb. The tribes and the color of individuals and the dialect—all of that is being identified in eternity. I think when we are created as human beings, God makes us in His image but he gives us a certain ethnicity or background or color to reflect the beauty of who He is. Our skin color is connected to the purpose which God created us. I think that on into eternity we keep that color as praise to God. And every tribe, tongue and language is present before his throne in Revelation. If we can identify that, it gives the assumption that we can also identify each individual and our uniqueness, as God has created us. I think those relationships we have on earth, we’re going to continue to experience in eternity. But here’s the joy of it all. In Revelation 21, it’s without pain, without sorrow, without suffering. We get to experience that in Christ. For those who are in Christ, there is that hope for you that those relationships you have enjoyed on earth, you will enjoy forevermore. Look forward to the hope of that, in Jesus, because of what He has done for you.